Our walk of Saturday 6 December 2014 takes place at the Athalassa Park in the outskirts of Nicosia. This is essentially an afternoon stroll, starting later than usual, at 14:00, to allow you more shopping time, given that we are in the pre-Xmas period. The walk starts at the parking area located past the ‘Andreas Zakos’ army camp, inside the Park. We strongly advise you to meet at the meeting place outside the Park, from where we shall set off at 13:45, in a car convoy. Even though the car meeting place is only a short distance from the walk start, this is a safe way to avoid getting lost due to some misunderstanding. The walk starts at 2:00 pm. Xenophon is leading this walk, which will go ahead even in light rain; if you need to, call 97613720. The walk will take up to 2 hours and is on flat ground, hence easy. We follow the well-marked pedestrian paths of the Park. Weather permitting, the walk will include a visit to the Athalassa lake. The meeting point in Nicosia is the Handicrafts Centre (Kentro Heirotechnias) on Leoforos Athalassas (Athalassa Avenue). The car trip starts at 1:45 pm. Please ensure you observe start times, for the benefit of the group. After the walk we shall sit down at the cafeteria ‘Barrage’ in neighbouring Aglandja, for a drink and a snack. We shall drive to the cafeteria in a convoy. Barrage is on 85 Larnaca Avenue (Leoforos Larnacas) and offers a large proprietary parking at its backyard, accessible from a driveway on the side of the cafeteria. How to get to the walk start: We urge you not to attempt to meet up at the walk start, unless you are certain how to get to the scheduled parking area located past the ‘Andreas Zakos’ army camp, inside the Park. Here follow the instructions. Get yourself to the junction (with traffic lights) between Limassol Avenue and Athalassa Avenue. Zero your odometer at this junction and proceed on Limassol Avenue. At the 0.3 km reading take the exit to the left, signposted ‘Athalassa’ with a large green sign. At the 0.7 km reading do not turn right, continue driving straight. At the 1.7 km reading turn right into a side road (there are no signs at this turn). At the 2.5 km reading you reach the end of this side road, turn right into an empty field and park your car. We meet here. The walk starts here. How to get to the meeting point for the car trip, coming from the Hilton hotel area: Get yourself on Makarios Avenue, heading out of town and set your odometer to zero as you drive past the Nicosia Hilton hotel. At the 0.1 km reading you reach traffic lights (with the Apoel club building on your right), go straight. At the 0.5 km reading you reach another set of traffic lights, go straight. Driving along, you pass a few more traffic lights, staying on this main road (named Leoforos Lemesou/ Limassol Avenue). At the 2.1 km reading, you reach a principal set of traffic lights. Set your odometer to zero again and turn right here. You are now in Leoforos Athalassas, a very busy avenue. At the 0.2 km reading you see a large empty space on your right and the Handicrafts Centre (a single-storey building) on your left. Park in the parking area. We meet here. The Handicrafts Centre is next to the church of St. Barnabas. How to get to the meeting point for the car trip, coming from the Presidential Palace area: Get to the round-about next to the Presidential Palace. From downtown Nicosia you reach this along the Kyriakou Matsi avenue or along the D. Severi avenue. Set your odometer to zero on the round-about and drive along the principal road towards Strovolos. At the 0.3 km reading you reach traffic lights. Go straight. At the 0.6 km reading you reach a 2nd set of traffic lights. Set your odometer to zero again and turn left. You are now in Leoforos Athalassas, a very busy avenue full of shops. At the 2.6 km reading you see a large empty space on your left and the Handicrafts Centre (a single-storey building) on your right. Park here. 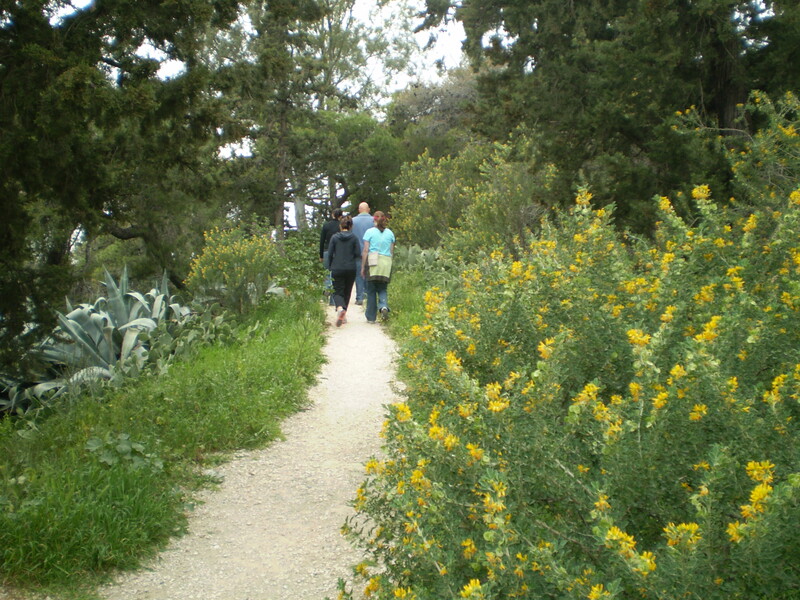 About Athalassa Park: The Park is the nearest large area of green servicing the capital Nicosia. It is located to the south of Nicosia and to the east of the Nicosia – Limassol motorway, near its start. It includes two picnic areas, roads, bicycle tracks, pedestrian lanes, sports grounds, parking places, a centre of environmental information, a bird observation point, a botanical garden and a lake. Its area is 840 hectares. The lake attracts many animals, birds (mainly migratory, such as egrets and kingfishers), insects (butterflies) and amphibians (turtles). The flora of the area is very diverse as most of the trees are planted; all the same, the Park does not provide much shade in the hot months, for the hiker.